The gig was great: flashing lights, temperatures rising, a lot of sound, enthusiastic audience. It was an exceptional night. LUX brought along some guests of our own starting with Jake El Tao, the guitarist from JESUS VOLT who joined us on Radio Static and Super 8, to another super guitarist, Michaal Benjelloun (for Winter in NY) who stayed to greet the lovely Gaëlle Buswel for her song The Joker, and on to singing with LUX on No new love yet please. 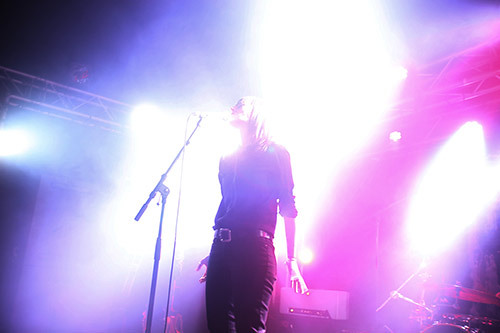 At Paris’ La Boule Noire, as supporting act for PLUG & PLAY, LUX had a set of 10 songs – including 4 from the EP and others as yet unknown to the public. Those additional guitars set the solos free. Great thanks go to ★The Road to Jacksonville who published LUX in their concert review of the Festival La Chapelle and again for this concert. Kind words indeed from those who really know their rock ‘n roll with a special mention to the photographers who captured the moments – Jehsong Baak, Yann Charles, Agathe Kipienne and Eric Massaud of Radio Fugue – although, truly, you had to be there to really feel the LUX! Dates for gigs in 2015 soon to be announced so stay posted for more news here and/or on Facebook – or send an email to lux-theband@hotmail.fr to receive our newsletter.